Another Beautiful Day in Paradise. Over St. Pete the skies were overcast and foggy. As one got to the Wall Springs area the skies cleared up and the sun was shinning brightly. 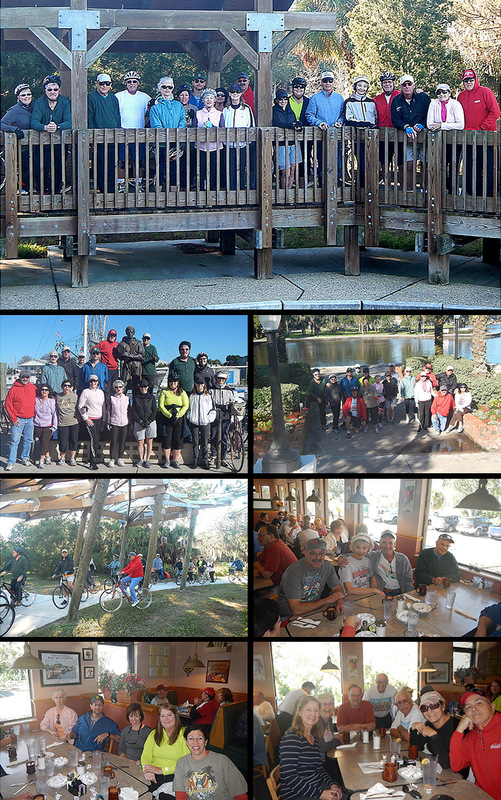 Blader/Bicyclers Vickie & Tim K, Steve G, Dee T, Carol J, Patrice H, Dimitri F, Patricia K, Amie & Rob H, Dorey Anne, Peggy E, Karen T, Bill & Diane S, Bruce M, Roy H, Ginnie S and Rick P came. Welcome all. We missed our group at the Great EsSkate but we know they are having a grand time. After doing the Wall Springs Park we decided to head North and do downtown Tarpon Springs for a change. We had 18 Bicyclers and one Blader, Dee. The Bicyclers did 9.5 miles and Dee did 10.5 miles. We Brunched at Rodie's restaurant as planned. We called ahead and they said it would be a 20 minute wait but we went anyway. We got in after about 21 minutes and seated at two tables. The service was good, the coffee flowed freely and the food was great as usual. Rick P rated his Brunch a 9.8 and I got another rating of 9.4. We'll give Rodies a 9.6.